Thank you for choosing our site for all the Wordscapes Bloom Frond Answers, Cheats and Solutions. This is a popular new game developed by PeopleFun Inc and the fun seems to never be stopping in this crossword-themed puzzle game. Since you have landed on this page then chances are you are stuck on Sunrise which is the first pack for Wordscapes. 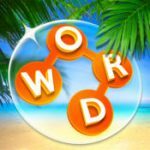 Check out Wordscapes Bloom Answers.